Did you ever think you would be able to watch your business from home? The 2009 Forbes magazine ranked Miami as number 9 in the Top 10 Most Miserable Cities in the country. The ranking was based on nine different factors, one of which was commute times. Not that Southern Florida is the only place in the country that has long commute times, however Orlando and Tampa also made the top ten worst commute list. Wouldn’t you like to able to stay at home on those really bad commute days and watch your business from home? Thanks to modern technological innovations in the security camera industry if you have a broadband internet connection at work and at home you CAN watch your business from home. Whether it’s a retail store, an office setting, or even a fruit or vegetable packing house, you can monitor your entire business operation at home. What’s more is the security camera system is easy to install, easy to use, and affordable priced so that even the smallest business can afford it. 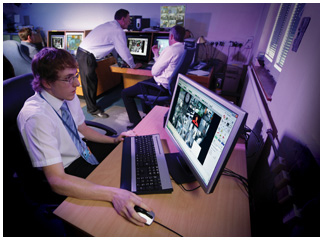 Technological advancements and innovative thinking have brought IP cameras to the security industry. IP or Internet Protocol cameras are usually connected using standard Cat 5 computer cable. One or more of these cameras may be used for your security system. The cameras use the internet as the medium for networking which means that anyplace there is internet access the cameras can be monitored and/or recorded and of course, this includes your home. These cameras are simple and easy to use too. If you use just one camera, it has its own internet video server so that monitoring can be achieved directly over the internet using a common browser such as Internet Explorer. For these cameras, there is no need for a capture board or a digital video recorder or DVR to broadcast their video over the internet. If the camera manufacturer doesn’t utilize a common internet browser program, then it normally supplies you with simple installation software for the computer that you will use to view the cameras. If you are one of our customers with older CCTV cameras with a BNC output connector for example, don’t despair! The older CCTV cameras can be networked too. 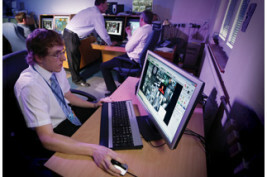 New IP servers can turn any older CCTV camera into an internet based networked camera as well. Just about anything a normal digital video camera can do, an IP camera can do as well. The only difference is that the IP cameras contains the extra hardware to be able to network it over the internet—and the same holds true for the network servers as well. In addition, depending on the system, the system can be monitored on more that one personal computer at a time. Or if you wish, one computer can be used for viewing live video while another is used as the DVR to record the video at the same time. Some units can even send you an e-mail if an alarm or event is triggered. Perhaps you only want to keep an eye on your business when you have left for the day. If you leave your business for the day and are concerned about the businesses security at night, day/night vision of night vision infrared cameras can provide you with a complete picture of your business, even after you have gone home for the evening. So talk to one of our experts about being able to watch your business from home and they will be able to recommend the exact system and components you need. Then kick back, have a cup of coffee, and stay home today—so you can watch your business.